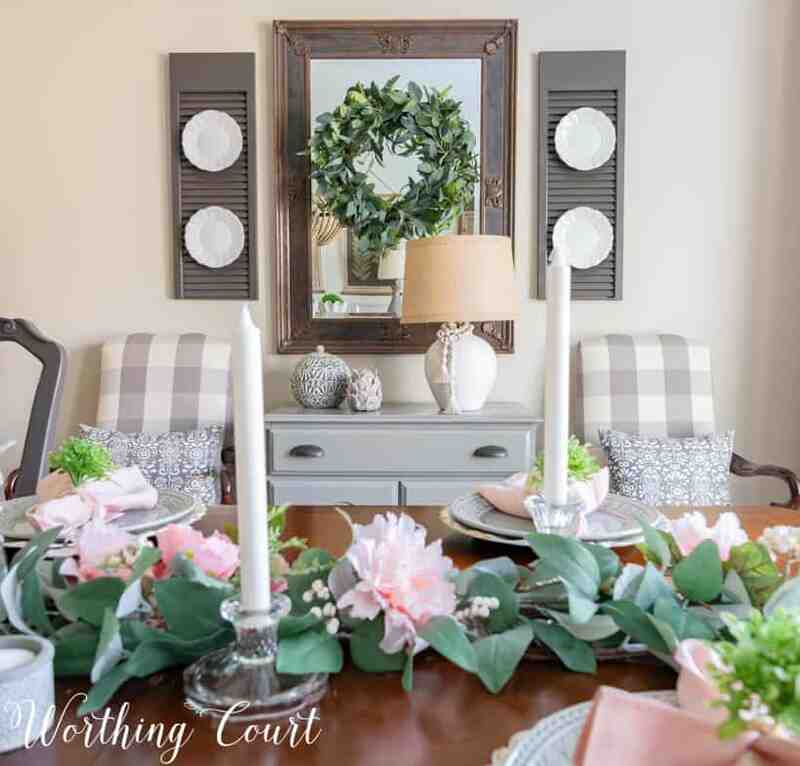 Get inspired to decorate your dining room for spring using these simple ideas that you can copy in your own home. Faux greenery and florals are your friends! Affiliate links have been used in this post. See my full disclosure HERE. Welcome to my dining room, my friends! I’m excited to be participating in the Spring Festival Bloghop hosted by my friend Kendra over at Joy In Our Home. 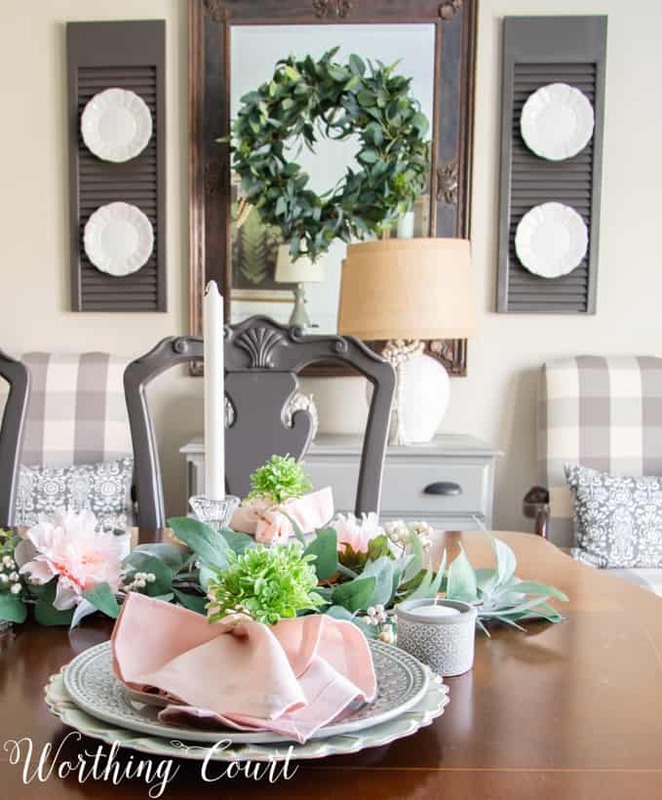 We’re sharing different aspects of spring decorating every day this week and today we’re focusing on Spring Vignettes. I’ll be honest, my dining room doesn’t get used a lot – typically only three or four times per year. But it’s a room that’s visible from our foyer and is a pass through to other rooms in our home, so I always like to update the decorations in it for every season and holiday. I almost always include a tablescape to go along with the season and this spring is no different. Honestly, the tablescape is so prominent in the room that it’s like one big vignette! Before I even added any spring decor to the rest of the room, I started by raiding my stash for items to create this pretty table. I think that the shades of green found in eucalyptus work well with my painted gray furniture, so I started my tablescape by intertwining two eucalyptus garlands with white berries together. One garland alone looked too skimpy, but by weaving two of them together it gave me a nice lush garland to run down the center of the table. Once the garland was in place, I added white candles to all of the crystal candlesticks that I had on hand and tucked them into the greenery – sort of staggering them down the center of the table. 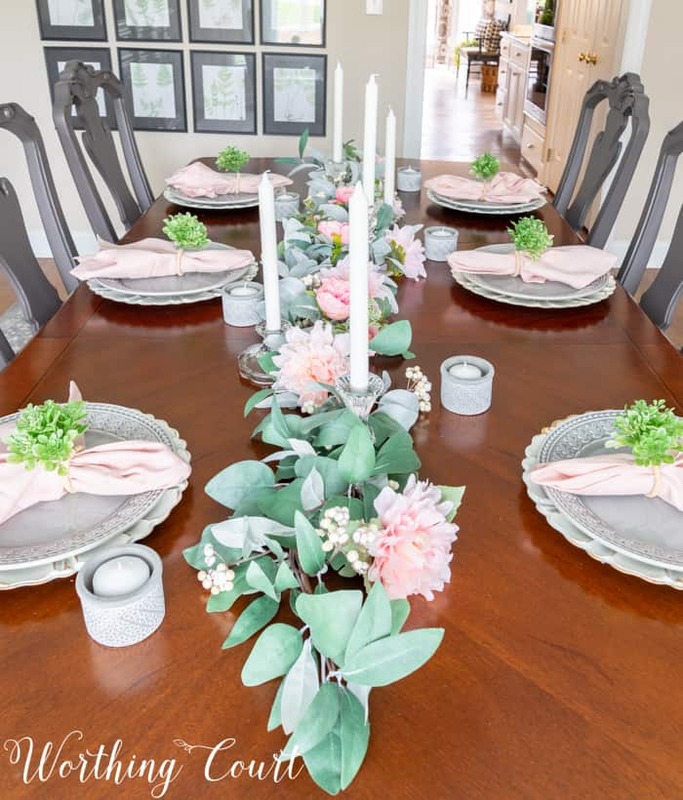 After the candlesticks were added, I simply tucked in a few pale pink faux peonies and cabbage roses. I think the soft shade of pink looks so pretty with the eucalyptus! Each place setting is so simple to put together! 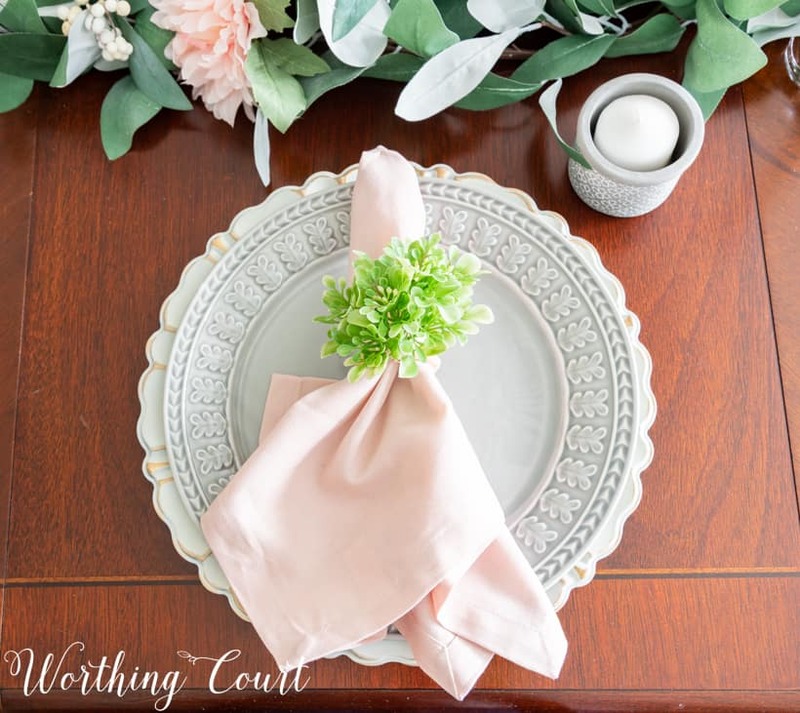 Pretty chargers with a scalloped edge, topped by gray dinner plates along with a pale pink napkin bound with a boxwood napkin ring. To add a little more interest, I added a cute little mini candle holder to each place setting too. Did you notice that I didn’t even add any silverware? I really don’t think it’s necessary if you’re only using your tablescape for decorating purposes. If you’ve been following along with me for a while, then you might have noticed that I took down the vintage shelf that used to be above the sideboard and replaced it with two wall hangings. I love the less cluttered look and am still trying to decide whether or not to keep my diy hanging lanterns there or replace them with something else. I think different lamps might be in order too. What do you think? In the meantime, I added a couple of plates to each of the baskets below the lanterns and tucked a couple of peonies into each one to carry the color across the room. On the other side of the room, I added more eucalyptus by displaying a wreath on the mirror. One of my favorite things to do in this room! The wreath is held in place with a suction cup hook, but you can also use Command Strip hooks. To finish that area off, I added a cute strand of wooden beads with tassels around the lamp base and a couple of gray accessories that I had on hand. Easy decorations that anyone can copy! Thanks so much for stopping by today. You’ll want to be sure to come back each day this week to be inspired by everyone else’s ideas! So pretty! I love the touches of pink! 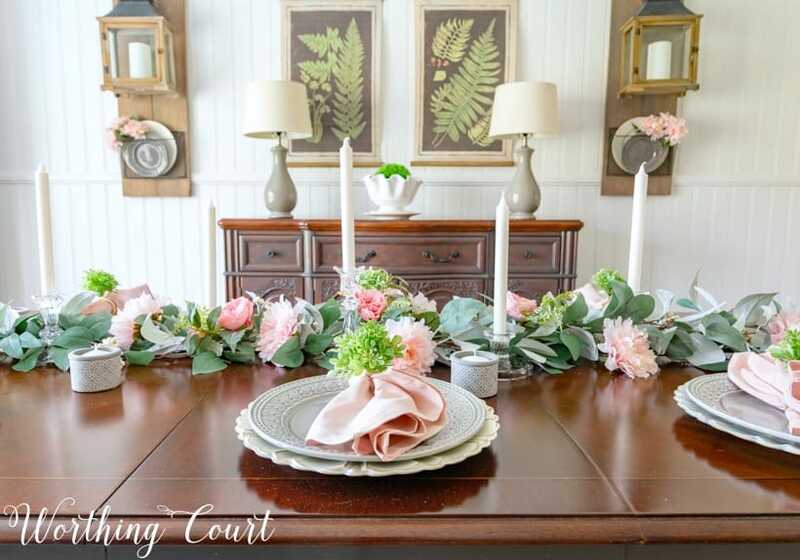 I love the garland down the table, the layers of dishes- the whole table looks gorgeous! I agree the color of the eucalyptus looks so good with your gray chairs! I love the wreath on the mirror and those botanical prints!! 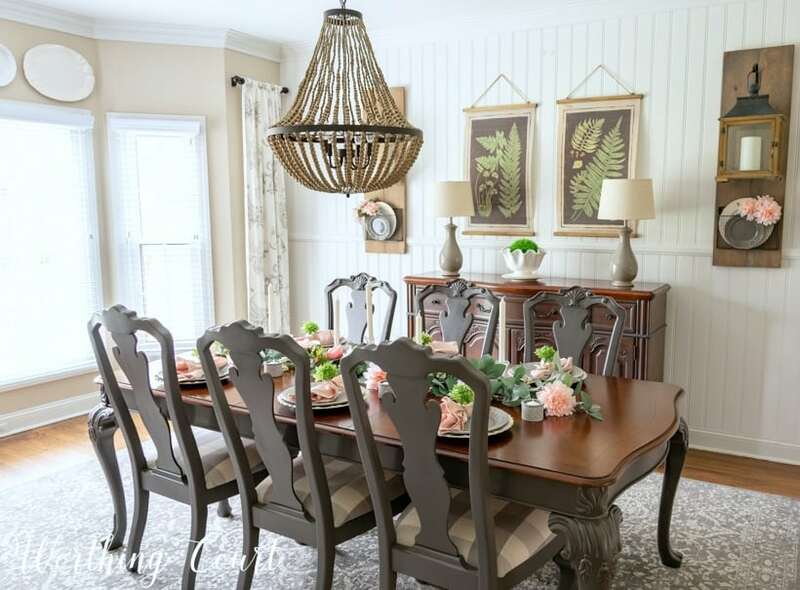 I also loving having a room that stays decorated and looks ready to welcome guests like your dining room. Thanks for the inspo! Fun to tour with you! Your tablescape is just beautiful!I agree if it’s for decor no silverware is needed. Your tablescape turned out great! As for wall ideas, I agree with the others. 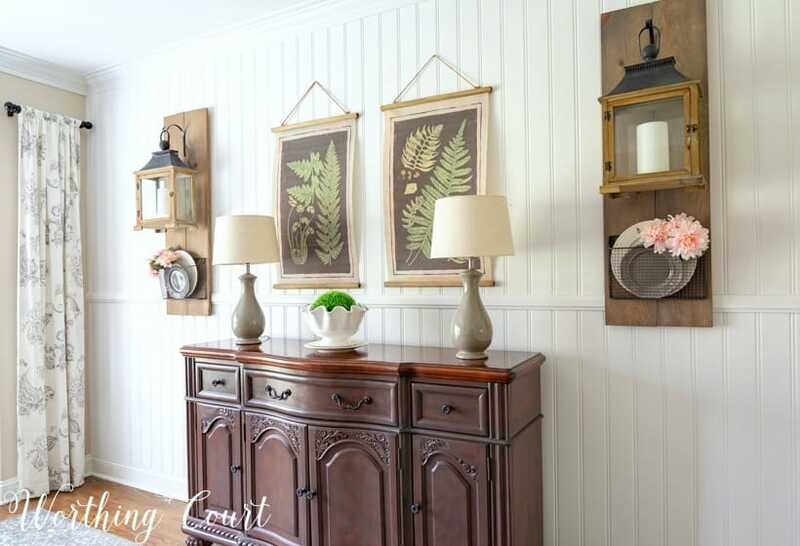 Because you have more decor on the other wall which looks awesome, I would remove the wall lanterns/boards and have just one bigger piece between two lamps. 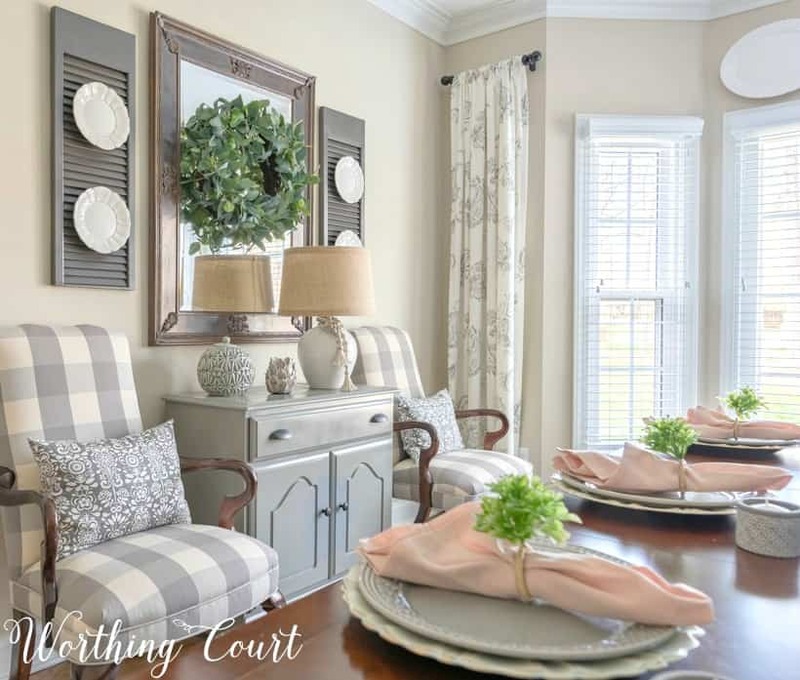 Or if you keep both prints, simplify what is sitting underneath…like one big pretty piece of pottery or whatever centered under the prints, thus eliminating too many “pairs” of decor items. You could use taller, skinnier lamps as you mentioned replacing the existing ones. To me, spring is about lightening up decor and simplifying it. Your table is more of the focal point right now so let that take center stage! Have fun playing around in your pretty room! That must be so nice to be able to set a beautiful tablescape like this and actually be able to enjoy looking at it for awhile since the table isn’t used all the time. It always feel like I put all this work into setting the table and then it all gets torn apart when the night is over. Your table looks perfect for spring, and I love the plates and chargers you used! Everything looks so pretty, the tablescape and the whole room. I love the pops of pink with the eucalyptus. I also feel liberated after reading this post. Now I can say “Suzy said you don’t have to use silverware if your tablescape is for decorating purposes and I think she knows a thing or two about decorating!” 🙂 I often have everything I need for a tablescape except the right utensils. So happy to be joining you for the hop this week. Happy Spring! Suzy, you created such a simple and beautiful tablescape for Spring. My dining room is right off the foyer in my house too and only gets used for meals on special occasions. I love how you used the garlands and added the tall tapers for some height. The flowers and coordinating napkins are a lovely touch, I love the color. Such a pretty tablescape! I’m always looking for ideas inspired by nature and I am going to use your idea for my table. Thanks for the inspiration! Your table is so pretty and perfect for a springtime brunch! I love all the floral and pink touches. So happy to be hopping with you this week! Love your table, beautifully done. Love the color palette too. Love your painted chairs and table. I would take down the lanterns and put something a little more (dressy, classic, not sure of the correct word?) I do love your site and think you do a great job of decorating, love to look at all that you do, such a talent! Have a great day! Such a pretty room! I love the soft colors. While soft, they add a big punch. Those botanicals are my favorite thing in the room. So. Pretty!!!!! And I agree, you don’t need silverware if you are just using the table for decorating purposes. Susy – so lovely as usual. You asked about moving your DIY lanterns and I thought that maybe that pretty mirror on the other wall could go above the display vertically (I know, very traditional thought :-)) and move the DIY lanterns to the mirror wall over the chairs with a pretty piece of artwork, or antique window so you can still add some seasonal decor. I am always moving things around at my house because sometimes you just get tired of the look. Maybe you have another area in the house – like above your mantel – where they would work also…just brainstorming out loud. Thank you for sharing and listening. Please tell me where you found those beautiful botanical prints!! I am in love with all things “fern” this spring and yours are beautiful!! Hi Connie. I apologize for not seeing your question earlier! The prints came from Antique Farmhouse. I’m loving all things fern this spring too and ordered them as soon as I saw them! What a good thing you bought them when you did! I just looked at the website and while they have a variety of lovely fern items, those prints aren’t there anymore. Oh, well. Thanks for your help! My favorite place to “stage” too – the dining room table – big and blank. I for one will miss your shelf, but I am more on the rustic side. The lanterns on the boards now look too bulky and rustic. You seem to be going more classic. If you are keeping the botanicals, I think it needs something lighter in feel. The hard thing is you are loosing a place to change up! I love visiting your home time and time again, and each tablescape wows me! You are so talented my friend! Its lovely spring dining room table decorating ideas. The flowers and candles really look great. I hope everyone will like these ideas at a glance. Thank you for sharing the lovely ideas. You just can’t beat pink and green together, such a fab combo! I Want to come to Easter dinner ar your table! I really love this room and you have done a wonderful job decorating it. Can you tell me how you attach the plates to your shutters? Thank you so much! Thank you, Karen! Each plate has a traditional plate hanger attached to it – the kind with the springs on the back. I then ran a long piece of floral wire around the part of the hanger where you would hang it from a nail and put the two ends of the floral wire through the slats of the shutter and twisted it together on the back of the shutter. Hope this makes sense!